Bush Wardens commenced in 1999 and is an after school Environmental Education Programme, offered 3 times a term to students from PP to six. (Kindergarten students may attend if supervised by a parent or older sibling.) It is organized on a volunteer basis by interested Noranda staff and parents. The programme of activities is centred around The Bushland Management Plan 1999. 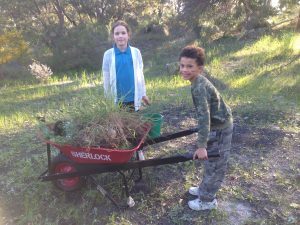 During the first semester of 2018, Bush Wardens has focused on onsite projects to help maintain a healthy bushland and to educate the children on the flora that is growing at Noranda Primary School. 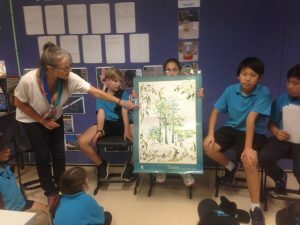 With the help of Alex Devine from the City of Bayswater, we have identified areas of need within our bush and he has guided us to participate in a variety of activities. We have planted and weeded within the area and learnt about the species that grow naturally in our locality. We have also collected seeds from trees in our bush, planted them and watched them grow. 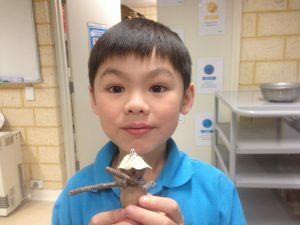 The team has also participated in craft activities such as making honky-nut characters as a means of learning about the marri trees in our bushland. 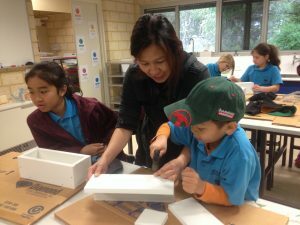 The last session for the semester involved a visit from the local Bunnings Warehouse, when each member made a planter box and added seeds to the soil. It will be exciting for the children to watch them grow. We will continue to provide interesting and educational activities for the remainder of 2018.